Make sure you have gdb and Emacs installed. I think gdb comes with Emacs, but I could be wrong. 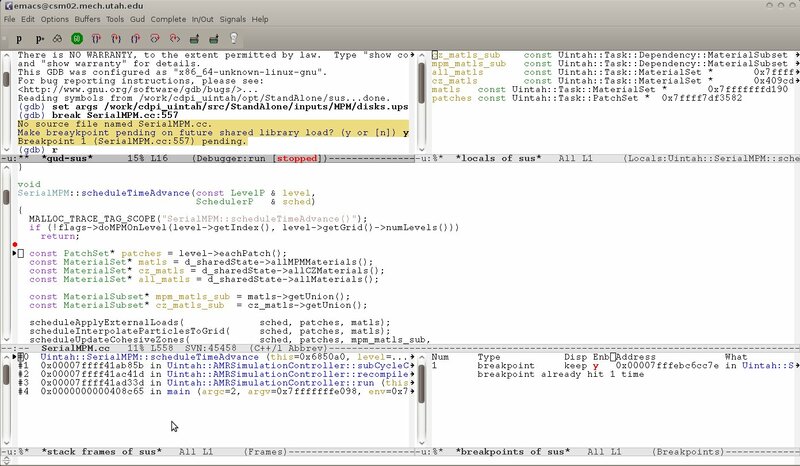 If you are using Ubuntu simply issue “sudo apt-get install gdb Emacs” and you should be home free. If you do not have sudo access to your machine, ask your system administrator to install them, or you can build them locally (yuk!). Another important note is that the executable you wish to debug must be compiled with the ‘-g’ option if you are using g++. If you are using a different compiler you are on your own to figure out what options you need. This will open Emacs in a separate window in the background so that your terminal is still usable. This GDB was configured as “x86_64-unknown-linux-gnu”. 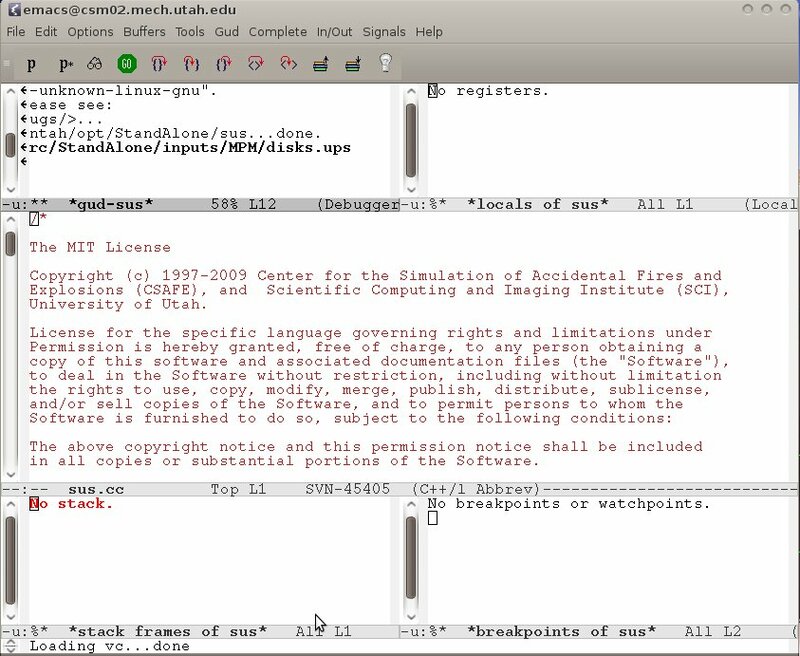 The upper left frame is the gdb window where you type commands to interact with gdb. The upper right frame will contain a list of variables which are in the current scope. Of course, our executable is currently not running so no variables are in the current scope. The center frame is where we view relevant source code. 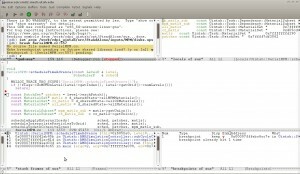 This frame behaves just like a standard emacs window with a few added features which will be discussed below. The lower left window contains information about the current stack which again is empty, but when the program is running it will provide useful information about where you have been in the code. The lower right window is a list of breakpoints, which we have not yet set. No source file named SerialMPM.cc. The red dot in the center frame is the location of the breakpoint, and the black triangle indicates the next line to be executed. From now on you can set additional breakpoints on any line you want by simply clicking on the gray bar where the red dot and black triangle are at. For example suppose we wanted to set a breakpoint four lines down from the current breakpoint. Simply click in the shaded box to the left of the line and a red dot will appear there. Now we have a second breakpoint. Cool. Now if you print out the value again you can see that it has been changed. Now suppose we want to see exactly how the program proceeds with the new value. We can use the ‘step’ command to step through the program step by step. This command tells gdb to only stop at breakpoint 4 if the variable ‘time’ is greater than 1.0. Then we disable all other breakpoints and type continue. Then the code will continue to run normally until the time is greater than one second, at which point it will stop at line 3013 in SerialMPM.cc. Now you can re-enable any breakpoints at other places in the code. 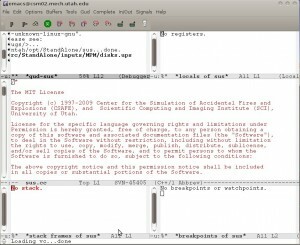 This entry was posted in Featured, Linux Tips, Tutorials and tagged args, Emacs, FORTRAN, g++, GDB, introduction, Linux, source code, Unix. Bookmark the permalink. ← Conference Poster: Hertzian contact theory applied to edge-loaded ceramic-on-ceramic hip bearings: analysis and validation.